One night featuring top artists in the music industry, performing for a noble cause. What more can you ask for? Choral groups will take part as well. The Ateneo Chamber Singers (where my husband sings currently), the UP MedChoir, and Mass Appeal, along with other solo artists and performers, and the ABS-CBN Philharmonic Orchestra, will join forces for the UP College of Medicine Academic Center. Hope you could support this concert! Full details below. 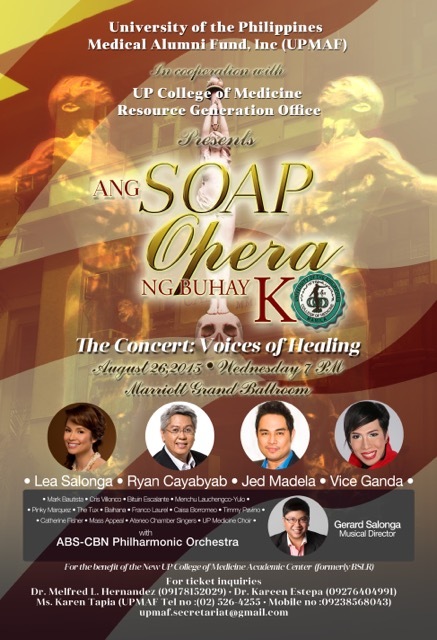 The University of the Philippines Medical Alumni Fund, Inc. (UPMAF) will hold a concert called “Ang SOAP Opera ng Buhay Ko” (The Concert: Voices of Healing) at the new Marriott Grand Ballroom on August 26, 2015 to raise funds to create the New UP College of Medicine Academic Center, a 7-story multi-million peso undertaking.